One of my favorite events is the Chouteau County Country Christmas. Communities throughout Chouteau County host special events the first weekend in December. My favorite is in Virgelle, where the open the doors for a weekend of antiques shopping and baked goods galore. One such Country Store shopping excursion netted me this beautiful Depression glass green oil lamp. I saw it and just had to have it! 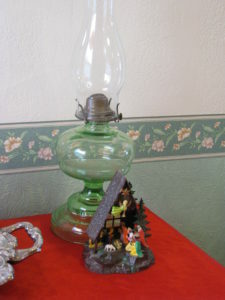 My wonderful Depression green glass oil lamp during Christmas At The Cottage 2013. In front is one of Grandma O’s Mid-Century Modern Nativity sets.